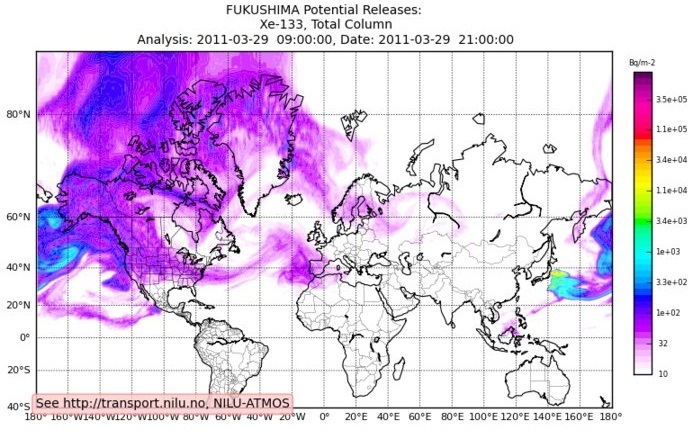 Xenon From Fukushima: What Is It Telling Us? Radiation from the damaged nuclear facility in Japan has been blanketing the United States mainland with radioactive Xenon-133 particles. In parallel, spent nuclear fuel pools at Fukushima have been reaching boiling point on several occasions alongside leaky nuclear reactors spewing out more radioactive smoke. The International Atomic Energy Agency (IAEA) has said that radiation is still being spewed from Fukushima and they are unclear of its source. Xenon radioactive isotopes may finally give a much needed clue in regard to what is going on within the nuclear reactors and spent fuel rod pools in Fukushima. Under adverse conditions, relatively high concentrations of radioactive Xenon isotopes may be found emanating from nuclear reactors due to the release of fission products from cracked fuel rods or nuclear fission of uranium during a partial meltdown. These materials can cause serious health risks if a person is exposed to them in above average quantities for long durations. Claims that nuclear radiation from Fukushima would dissolve over the Pacific have proven to be completely inaccurate. Indeed, the latest charts show that radioactive fallout from Fukushima will not just smother the United States, but most of the globe. The Comprehensive Nuclear-Test-Ban Treaty Organization has already warned that Fukushima would contaminate surrounding areas in the northern hemisphere for the next several weeks depending on wind patterns. Radioactive Xenon does not exist in the air naturally. Traces of radioactive Xenon from Japan’s crippled Fukushima nuclear power plant have now been detected in a number of countries across the globe. Radioactive Xenon isotopes have been found in Korea, China, the US and also as far as some European countries according to international monitoring agencies. The US, in particular, has seen elevated levels of radioactive substances in several states, including California and Colorado. Amongst major cities, Las Vegas detected abnormal radioactive isotopes including Iodine-131 and Xenon-133 from the damaged nuclear plant in Fukushima. Radioactive Xenon-133 has a half life of 5.3 days and it appears to have now reached the entire US Eastern seaboard, and will soon cover most of the world. It is important to stress that health authorities around the world insist levels of all four of the radioactive isotopes being released from Fukushima, namely Xenon-133, Iodine-131, Caesium-134 and Caesium-137 are harmless to people living outside of the Fukushima exclusion zone. The Japanese government in the beginning continued to insist the problem is more or less under control. More recently, the Japanese prime minister Naoto Kan has said that his government remains in a "state of maximum alert" and the situation at the nuclear plant "continues to be unpredictable." The assurances from the health authorities and the government of Japan have not been adequate to prevent the US military from preparing the mandatory evacuation of tens of thousands of American troops and their families in Japan out of concern over rising radiation levels. Less than a week after the Japan nuclear crisis started, president Obama ordered the evacuation of American personnel from Japan raising more questions about the reliability of all those assurances.